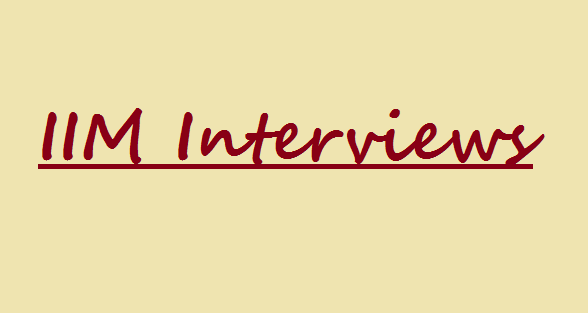 The second one in series of 7 interviews was the one for IIM Kozhikode. The eve of second interview again witnessed some hasty preparations as were there for the IIM Indore Interview, going on but with diluted vigor. The existing protocol prevailed and things were brought in place. I am presenting this interview experience in more of a direct speech as I remember most of it (hopefully!) being fresh to memory. After the GD sessions, started the dreaded PIs, as the Personal Interviews were now being called by us. It seemed that they called us in according to the order in which we were called for the group discussion. I was fourth in order at both the places. Stories of stress interviews, professors laughing on answers and other tactics were hovering all around in the room where we waited and each candidate returning from the PI added to anxiety. However soon the apprehensions had their peak and as interviews progressed further these were being subdued, well atleast for our panel. A technical oriented grilling was what I was hoping when I entered, more so when there was a systems professor there in the room. As I entered I found one of the panelist was away and the only one left there caught me offguard by throwing in a question before allowing me to sit. Panelist 1- Introduce yourself !! Me - Sir, My name is . I hail from and more on my prepared script for most part of it. It was then, that he gestured me to take my seat and picked my graduation mark-sheet. Panelist 1 - What is you favorite subject at engineering. Panelist 1 - He then asked me to explain how communication takes place between two mobile sets. Me - I knew the process well and hence explained. Panelist 1 - Could you explain me the technical concepts involved in GSM? Me - Yes sir, the environment uses TDMA for the the purpose of networking and communication and then followed with all the gyan I knew about it. Panelist 1 - Modulation scheme? Me - Frequency modulation sir. Then again some Hows and whys around the topic and I answered most of them to atleast my satisfaction. It came to a situation where I would have repeated myself in the answers but panel changed the topic in right time. Meanwhile the second professor had appeared on the scene. Panelist 2 - What is this website on environmental club all about? Me - Sir, I am an active member of the club and am handle the website for the club voluntarily. THe website is to spread the message of the club and to act as single point of information for all environment related information especially pertaining to the campus. I answered most questions except about a word that came from nowhere and had no idea. Panelist 2 - If you are made the the chairman of the pollution control board then what steps would you start with? Me - I talked about public transport..metro etc..and then about irregular traffic management and recommended switching engines off during traffic jams. (hope i made some sense there). Panelist 1 - Who is president of Afganistan? Panelist 1 - Is he an Indian? Me - Sir he has roots in India but am unaware of actual relation. Panelist 1 - What is capital of Burma? Me - I don't know, sir. Now they realized lack of international geography in my knowledge base so came back to India. Panelist 2 - How many North-Eastern States are there? Panelist 1 - Can you name them? Me - Now I was ready with the names. blurted them. Panelist 2 - Ok Tarun, What was the first question you were asked? Me - Sir, I was asked to introduce myself. Panelist 2 - Apart that. Me - Sir, about my favorite subject. Panelist 2 - (looking at other panelist as he was not in there at the time) Are you sure ? Panelist 1 - Ok Tarun, thank you. It was nice talking to you. Me - Thank you sir. Thus ended the second of seven GD/PIs that CAT 2008 had entitled me to appear for. Next was the salivating Bangalore and my experience would be available here soon. 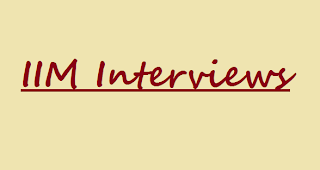 Are you looking for more interview experiences? Want guiding pointers for preparations? Need more inputs to strategizing?